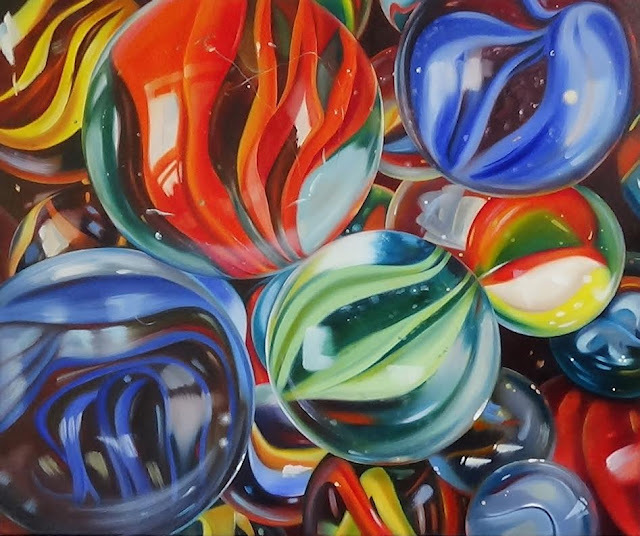 Having sold the first large painting in my 'Finding My Marbles' series (you can see it here), I decided to do another one, larger still, but this time with a warmer feel. The first was mostly cool blues and cool greens, but this time I chose to focus more on the warm reds and oranges. They are similar but with a different feel I think. So, have I found my marbles yet? We've done marblelous haven't we? This is quite a big painting and so must be even more stunning than it is here. This one must be a prize-winner ... it just has to be! I would love to see this painting in life. This small image is so incredible, and I know that it is even more amazing on a larger scale. Well done, Sandra!!! Sandra this is beyond incredible! The amount of detail in this is mind blowing - it's hyper realism but in a really cool and imaginative way! Lol, join the club Kathryn!